Artist Robert Dallet devoted his entire career to illustrating animals from around the world – from tropical birds and playful monkeys, to fierce wild cats. He produced a large body of work portraying not only the animal kingdom, but natural environment, its greenery and exotic landscapes. 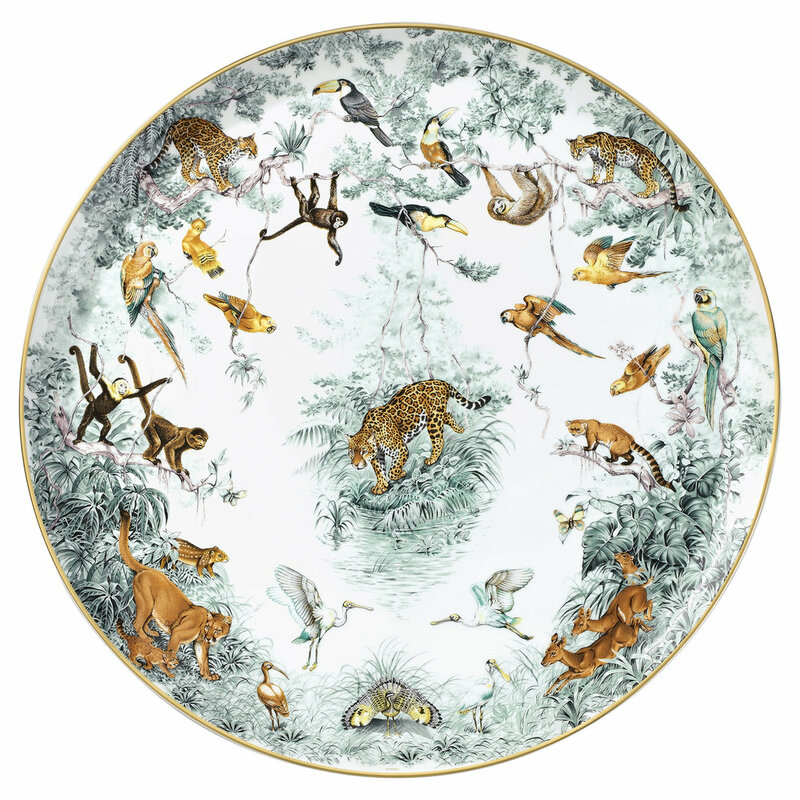 This peaceable kingdom has now been adapted into Carnets d’Équateur, a full range of porcelain tableware and objects from Hermès. 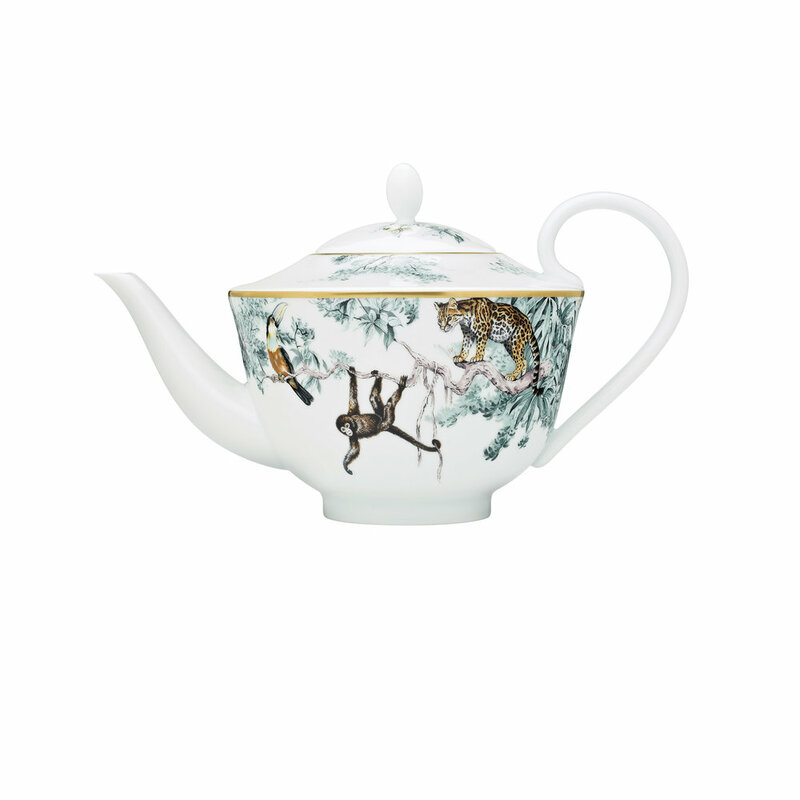 Each piece in the collection is dedicated to the artist’s various techniques, with delicate line drawings and watercolor-like paintings of our colorful natural world contrasting beautifully with the cool white and pale celadon porcelain. Assembled together like pages torn from a sketchbook, the dazzling table service depicts an earthly paradise, each featuring a different charcoal sketch, pencil drawing or hyper-realistic painting. The extensive collection consists of over 35 different pieces, from large tureens to tiny cups, all in various shapes and sizes. Robert Dallet was first discovered by Jean-Louis Dumas, then president of Hermès, back in 1984. The artist and naturalist went on to collaborate with the house for over 25 years, first contributing designs for Hermès iconic silk twill scarves. The partnership between Hermès and the artist’s estate continues to this day. In addition, Hermès has returned to its first collaboration with the artist to produce “Panthera Pardus”, a portrait of a solitary leopard, as the subject of its 2016 charity silk twill scarf. A portion of the sales proceeds will go to Panthera, the global wild cat conservation organization. In the artist’s honor, Panthera and Hermès have partnered to create “The Robert Dallet Initiative for Wild Cat Conservation” providing protection for these rare and often endangered animals, the artist’s most passionate subject.